On Wednesday, September 19, Mount Saint Mary College students in the Summer Undergraduate Research Experience (SURE) program displayed their research at the annual SURE Symposium. 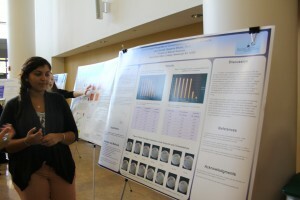 From five to six p.m. students stood by their poster display in the Aquinas Hall Atrium to answer the questions of peers and faculty members about the research they performed this past summer. Students presented research in a variety of areas, from the Natural Sciences, to Education, to English. The Atrium was swamped with interested and proud faculty members, parents, and students inquiring their peers about their work. Food and beverages were served; it was a lively environment full of excitement and curiosity. The students were enthusiastic and prepared to share their work with members of the Mount Saint Mary College community. After the presentations were complete, students and faculty were invited to attend a lecture by two keynote speakers, artist Laura Von Rosk, and renowned scientist Dr. Sam Bowser. Laura Von Rosk, an award winning landscape artist, combined her talents with scientist Sam Bowser on a journey to Antarctica to research “Forams,” organisms that live in the cold water of Antarctica. As Dr. Bowser continued his research, Von Rosk had the time to paint the beautiful Antarctic surroundings. The night ended with a dinner in Whittaker Hall to celebrate the accomplishments of SURE students and mentoring professors. Dr. Bowser and Laura Von Rosk were also in attendance to continue discussion of their research and artistry. The 2012 SURE Symposium was a great turnout. We look forward to hearing more from our Undergraduate student researchers in the future.